Self-driving cars, 3D-printed organs and spacecraft that can mine distant asteroid are all emerging technologies that have dedicated scientists and research labs working on them. But the exact launch timetable for any of these is a bit unclear, and the big breakthroughs always seems to be permanently stuck just over the horizon. 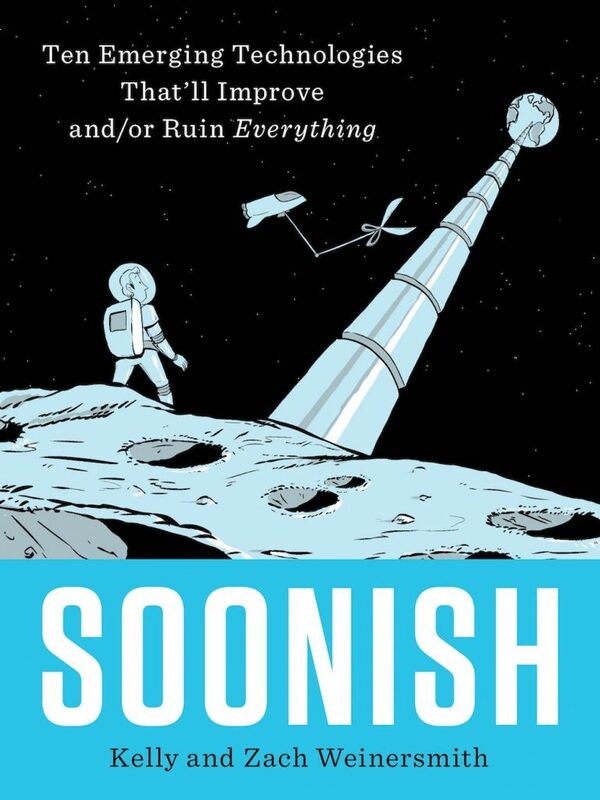 In their book Soonish: Ten Emerging Technologies That’ll Improve and/or Ruin Everything, biologist Kelly Weinersmith and cartoonist Zach Weinersmith, creator of Saturday Morning Breakfast Cereal, ponder the promises and perils and give an update on the state of these technologies. Plus, take a look at the book cover below with the Soonish AR app, and see another view of the space elevator. The app is available to download from Google Play or the iTunes app store. Zach Weinersmith is creator of Saturday Morning Breakfast Cereal, founder of BAHFest, and author of Augie and the Green Knight (Breadpig, 2015) based in Houston, Texas. Kelly Weinersmith teaches at Rice University and is the co-author of Soonish: Ten Emerging Technologies That’ll Improve and/or Ruin Everything. IRA FLATOW: This is Science Friday. I’m Ira Flatow. You know, we like to geek out around here a lot, if you haven’t noticed, especially when it comes to new technology. Over the years, we’ve talked about fusion reactors, self-driving cars is another big topic we’ve talked about. Google and Uber are just a few of the companies jumping into the game. But when you ask when we might see one on the road, well, that timetable always seems to be just over the horizon. And that happens a lot with big, exciting technologies. Hello, graphene. I’m talking about you. We keep talking about it. We haven’t seen any real graphene products. So how soon is now, when it comes to these emerging technologies? How soon are we going to see self-driving cars, brain computer interfaces? Or any of these technologies. When are we going to see them shape our future? My next guests have thought all about this. And they’re both authors of the new book, Soonish– Ten Emerging Technologies That Will Improve and/or Ruin Everything. Kelly Weinersmith is a biologist and Adjunct Professor of Bioscience at Rice University in Houston. And Zach Weinersmith is a cartoonist, and creator of the webcomic Saturday Morning Breakfast Cereal. Welcome to Science Friday. KELLY WEINERSMITH: Hi. Thanks so much for having us. IRA FLATOW: You’re welcome. I just want to clue our listeners in on our number. 844-724-8255. What technologies are you still waiting for? And let us know what you’re talking about. I really related to the title of this book, Soonish, as it relates to technology. Because as a journalist who’s been who’s been covering technology for some time, I always hear about technologies that never quite are ready for prime time. I recall years ago there was an author named Jerry Pournelle. He was a columnist back in the 1980s, who wrote about the computers and software for that giant magazine called Byte. And he had a term he coined called “real soon now,” all is one word. If we had hashtags back then, that would be a hashtag. And one bit of technology in particular, you mentioned nuclear fusion in your book. I have been talking about this with scientists for like decades. And it’s always 30 years away, no matter when you talk about it. It’s going to be 30 years away. How did you narrow down all the top Soonish topics you wanted to talk about in your book? Let me ask Kelly that first. KELLY WEINERSMITH: Well, so for the book, we ended up with a mix of technologies, some of which are already starting to become part of our lives. And some of which, like fusion, always seems to be 30 years away. And so we tried to have a nice mix of technologies that are here now. And some that we may never even see. IRA FLATOW: Tell us why that you included that. You left the possibility open. KELLY WEINERSMITH: We think it’s really important. And one thing that’s sort of under-reported, is to consider how these technologies could also be awful. And actually, while researching the book, we were surprised at how little it seemed most people were thinking about the potential negative implications. So we felt like an honest portrayal of the technology included both how it could make everything awesome, but also how it could ruin a lot of things. IRA FLATOW: And Zach, you approach a lot of the complicated topics in a very approachable way. Sort of the same way in Saturday Morning Breakfast Cereal. How do you describe your style of explaining science? ZACH WEINERSMITH: Yeah. Our main thing is we try our best to start at first principles, like to assume someone knows very little but is paying attention. And then we build up to something complicated. That’s especially true in the fusion section, because we really try to explain what’s actually going on there. Because if you don’t understand it on a fundamental level, you don’t understand why it’s so very difficult to make it happen. IRA FLATOW: And Kelly, you’re a biologist. So how was this type of research, let’s say, different from what you normally do? KELLY WEINERSMITH: Well, the process of researching was pretty similar. Although I don’t usually call experts that I don’t know and ask them questions about the field, so that was a fun new thing I got to do. But I really like having at least one project that’s totally outside of my usual line of work. It’s just exciting to get an excuse to read broadly, so that was really fun for this project. But otherwise, it was mostly reading primary literature. IRA FLATOW: Did you pick the order any certain way, the 10? And then you have other extra ones that you had no room for at the end? ZACH WEINERSMITH: Yeah. So we started with 50 technologies. And it just turns out that would have been like a 50,000-page book, which wouldn’t have been desirable on a bookshelf. But so yeah. We kind of wanted to have a certain number of physics-y things, a certain number of biology-y things, a certain number of computer things. But also, as you say, our concluding paragraph contains four chapters we ended up nixing for a variety of reasons. Even though it killed us, some of those were chapters we worked on for months before we gave up on. IRA FLATOW: One of the topics we get listener calls and emails about all the time is the space elevator. I know that’s in your book, I was reading about it. And and that’s part of the chapter called, “Cheap Access to Space– The Final Frontier is too Damn Expensive.” Why did you choose that? I guess you’ve been reading our emails. KELLY WEINERSMITH: Well, it’s such a neat technology. And the problem that is keeping space elevators from happening is fascinating. Like what we’re missing is that middle part. So we know how to make the base, we know what we would need to do to get a counterweight out into space. But figuring out how to make the cable that the elevator would climb turns out to be a really hard problem, because it needs to be really strong, but really lightweight. And it ends up being a really interesting problem, trying to figure out what that material should be. And so carbon nanotubes are the current front-runner. But at the moment we can only make them a foot and a half long, and they need to be 62,000 miles long. So there’s a long way to go. IRA FLATOW: Yeah. And as far as self-driving cars in your book, you categorize it as a programmable matter. One idea to get all these cars or robots moving together is to let them evolve. What’s that about? ZACH WEINERSMITH: Yeah. This is one of my favorite parts we found. So there’s– I’ll try to do this quickly. But there are these little robots, they’re kind of cubes. But they can roll around, and they can assemble into various shapes. They can dock with each other and sense each other. And so the idea is what you could say is, hey blocks, assemble yourself into a random configuration, and go as fast as you can. And you can have several piles of blocks, say, doing this over and over. And then you, quote unquote, “make them” the best designs until you start getting faster and faster configurations. And so you discover things about the best way to configure these machines just by letting evolution happen. IRA FLATOW: And you talked to David Duff, who was trying to make something called, bucket o stuff, bucket of stuff. What is that? ZACH WEINERSMITH: Well, we didn’t talk to him directly. We read some papers where people referenced him. We mostly were enamored of the name bucket of stuff. But the essential idea is it’s sort of like the T-1000 from Terminator 2, only it’s helping you out around the house instead of killing everyone. And so on a fundamental level, it’s just tiny little machines that have the ability to dock with each other, to sense each other, to know where to move, and to take up any shape you might want them to take. KELLY WEINERSMITH: This was one of the favorite things we discovered while we were researching the book. So an undergrad named Serena Booth at Harvard, discovered that a robot that she was operating at a table sort of away from everyone else, could ask individuals if they would let it into the dorm. There were lots of reasons you shouldn’t let anyone or anything into the dorms, but individuals let the robot in about 20% of the time. Groups let the robot in like 71% of the time. So if there are any robots out there, humans are real dumb in groups. But we’re even stupider if the robot has cookies. So when she gave the robot cookies, and a little box from a fancy cookie store, almost everyone was letting that robot into the dorms. So you can get access to the living quarters of some of the smartest people in the world if you’re just carrying cookies. IRA FLATOW: Very cheap work-around, as they would say. IRA FLATOW: Let’s go to the phones. Our number is 844-724-8255. Let’s go to Ohio. Christopher, hi. Welcome to Science Friday. CHRISTOPHER: Oh, hi. My question was to the guests. When they might think that the artificial uterus, or artificial womb, might be coming to be used by the public. IRA FLATOW: Is that soonish? Kelly, Zach? ZACH WEINERSMITH: That’s not something we researched. But I should say we have a policy that we don’t tell people a time estimate. Because our general view is that really advanced technologies like that tend to come at a surprising time, new technologies. Well, we talked about this a little in the book. IRA FLATOW: No, but you do talk about 3D printing. Bio-printing, why stop at seven margaritas? You can just print a new liver. ZACH WEINERSMITH: Print a new liver. Yeah, well, for the record, one of the people we talked to pointed out that liver surgery isn’t like a trivial matter. So you might still want to skip the margaritas even if you could print a liver. But yes, in terms of organ printing, there are a number of people working on it. In terms of timeline, I don’t know. Maybe 30, to 50, or 100 years. IRA FLATOW: Yeah, soonish. And then, of course, synthetic biology would be in that realm, too. You talked about that. KELLY WEINERSMITH: Yeah. So a lot of the synthetic biology stuff that we talked about is entering our lives right now. Like CRISPR-Cas 9 is a way to edit genes. That’s becoming much more common. And it’s used in labs all around the world, and it’s starting to get used on human cells. So that technology is definitely here, but it’s hard to know what the future holds for what we’ll use with that technology. IRA FLATOW: And Zach, asteroids are literal goldmines in space. I talked about that. But you got to capture one, right? ZACH WEINERSMITH: Yeah. It’s remarkably difficult. So you have this idea of asteroids as sort of big potato-shaped rocks like in Star Wars. But in fact, a large number of them are what are called rubble piles, like collections of rocks and dust. And furthermore, they’re often spinning. And the really hard part on the brain is that they’re in microgravity. So suppose you drill into one and it’s made of dust, what happens is it just flies apart. So just transporting these things around is a real problem that people are still working on. IRA FLATOW: Now one of the things that never developed– some things come along, you think, oh, that’s the next big thing, that never developed– which are the Google Glass. Right? The augmented reality. IRA FLATOW: Well, it was a big flop. And then we had Pokemon Go, which was big for about two weeks. What are some of the ways that researchers are tackling these ideas? And why do some things like these just burn out so quickly? ZACH WEINERSMITH: It’s hard to say. I think people’s reactions to these things, social reactions are unpredictable. So we talked about with Google glasses, what you might call the punch-in-the-face problem, which is– I think it was the CEO of meetup.com, literally said in 2014, if I see someone wearing Google glasses I will punch them in the face. I think he got a visceral response to seeing someone walking around with a camera and the heads up display on their head. And so I think engineers tend to not think terribly hard about the social response to a sweet technology. IRA FLATOW: Yeah, maybe if we didn’t have the Borg. The Borg sort of made things on your head a lot. ZACH WEINERSMITH: Yeah, it made it a little creepier, yeah. IRA FLATOW: A little creepier. I’m Ira Flatow. This is Science Friday from PRI, Public Radio International. Talking with Kelly and Zach Weinersmith, author of the new book. Soonish– Ten Emerging Technologies That Will Improve and/or Ruin Everything. And it’s great, great fun reading this book. I was playing with this in my office before we came on the air. You actually have a hidden augmented reality image on your book cover. Right? IRA FLATOW: Now all you need to do is download the Soonish AR app from iTunes or Google Play. And we have it on our website to try it out at sciencefriday.com/soonish. And you just hold up your smartphone to the book cover, and whoa, stuff jumps out at you there. KELLY WEINERSMITH: Yeah. It’s a space elevator. And the space elevator actually moves up the cable as you’re watching it, and it changes angle as you move your camera around it. And we’re working on a number of different additional AR images that are going to go into the book a little bit later. IRA FLATOW: It’s on many different levels, this book. So you’ve made it sooner than soonish to have this kind of thing. ZACH WEINERSMITH: Yeah. That app was actually based on a really cool app called Ethnobotany Workbook, which was made by a class– I want to say in 2011– with the idea that it’s like a taxonomy book. But it’s way easier to do taxonomy if you can see a 3D thing popping out of your page, than to look at a flat black and white image. IRA FLATOW: Yeah. Let’s go to Lawrence, Kansas, to Tim. Welcome to Science Friday. TIM: Hello. Thank you. Quick question for your commenters this lovely afternoon. I heard you guys were talking about self-driving cars earlier. And then, of course, the robots after that. My question was, how soon do you think we’ll be having self-flying airplanes? IRA FLATOW: Always. The Jetsons. Always part of the future. ZACH WEINERSMITH: Good question. Yeah. Actually, I was talking to an aviation guy about this by dumb luck. It’s not something we explore in the book, but he said to me– he was like, what are you talking about? We already have them. They already land themselves and fly themselves. It’s just the pilots do a little bit, but they already– it’s an easier problem than a self-driving car to make. An airplane has a much simpler environment than a car, which might hit a puppy dog or something, or have to deal with a blizzard. So we actually already have that, at least for commercial jet airlines, that sort of thing. IRA FLATOW: Now if you listen how loud a drone is when you buy one, can you imagine having to pick up a person with that kind of noise? And how much noise that would have to get them all around together? IRA FLATOW: Zach, as a cartoonist, is there any type of technology– real or imagined– that you would love to have? And draw about. IRA FLATOW: Is that a bit dangerous, though? To read your brain. ZACH WEINERSMITH: I don’t know. To get that like three hours a day back, I’d probably be willing to go through the brain surgery. Yeah. IRA FLATOW: Well, you don’t want any editing capabilities of that, though. That’s kind of dangerous. Who knows what you’re thinking up. ZACH WEINERSMITH: Yeah, yeah. Yeah, that’s a problem. Yeah, we generally are interested in privacy concerns, and brain computer interfaces have probably the most serious privacy concerns you can imagine. Because they’re directly interfacing with the most private part of your existence, your internal thoughts. IRA FLATOW: But that’s part of the book cover where you say they could save or destroy us, something like that. ZACH WEINERSMITH: Yeah. Oh, I think BCI– Brain Computer Interfaces– are the most likely in the long term to destroy what we think of as human beings, because they will be us altering us for the sake of market benefits, that sort of thing. IRA FLATOW: Yeah. Well, you left out an enormous amount of stuff that’s at the back of your book. If you had 11, what would be the 11th one you’d put in? Any of your favorites? ZACH WEINERSMITH: Yeah. I can actually tell you, because our original manuscript contained 11, and we had to cut it down for length considerations. But we took out a chapter that was going to be on the future of nuclear fission power, what people usually think of when you say nuclear power. A whole complete chapter we ended up cutting. KELLY WEINERSMITH: It was heartbreaking. IRA FLATOW: We had that, it came and went, in case you didn’t notice. OK.
IRA FLATOW: This is a great book. It’s wonderful to read. It’s called Soonish. It’s 10 emerging technologies that will improve and/or ruin everything. Kelly and Zach Weinersmith, thank you both for taking time to be with us today. KELLY WEINERSMITH: Thanks so much for having us. ZACH WEINERSMITH: Thank you so much for having us. IRA FLATOW: And we have an excerpt of the book, and you can try out the AR app on our website at sciencefriday.com/soonish. BJ Leiderman composed our theme music. And of course, if you missed any part of the program, you want to hear it again, you can hit Subscribe to our podcast. We’re also on the Amazon Echo and Google Home. I’m not going to say it, because I don’t want to turn on everybody’s Amazon or Google Home product. So everyday now is Science Friday, because you can hear us all week. And we are active on Facebook, and Twitter, and Instagram. And you can send us emails– scifri@sciencefriday.com. Send your feedback. Tell us what you’d like us to cover. Have a great weekend. Happy Halloween. I’m Ira Flatow in New York. An excerpt from "The Simpsons and Their Mathematical Secrets." When it comes to evolution, Bill Nye the Science Guy won't be denied.